Well, I’ve had myself a very busy year thus far… lots of travelling, playing, recording etc and it has resulted in a shortage of new material here on Work & Worry. I’ve amassed quite a backlog of very worthy discs for review consideration, and now that I’m determined to get back on that journalistic horse, one release in particular looms larger than most: a triple-disc set of previously unheard recordings from one of the most important fingerstyle guitarists of all time, Davy Graham. Many consider Graham to be “ground zero” for the guitar-centric British folk and blues revival of the early sixties, and indeed it is hard to imagine that landscape without his influence. Legendary guitarists like Martin Carthy, Bert Jansch, John Renbourn, Wizz Jones, and a host of others have expressed a debt of gratitude to the man who is widely considered to be the first known practitioner of DADGAD tuning, an innovation that has had a massive affect on not only solo acoustic guitar playing, but also the continuing evolution of traditional Irish and Scottish music… but Graham’s reputation is based on so much more, like his introduction of Baroque-inspired counterpoint on the folk guitar (“Anji” to this day is still considered a total game changer) and his expansive use of musical motifs from every possible source, from traditional British Isles tunes to American folk, blues and jazz, to mysterious modal compositions from the orient and beyond. Even though Graham’s mythical status in the guitar community is secure, wider recognition for his work has been elusive. He was ahead of his time, to be sure, but I believe that there were a few other things at work. Graham did record a fair number of albums, and these were beyond eclectic… listeners might find themselves bopping along to a jazz standard one moment, weaving through an elaborate raga exploration the next, and sitting politely through a contemporary number like The Beatles’ “I’m Looking Through You” or Joni Mitchell’s “Both Sides Now”, all on the same LP side! That “sitting politely” bit was a light-hearted jab at what many consider Graham’s weak link: his singing. Though he was a sincere singer, and occasionally quite endearing (tracks like “All The Sad Young Men” and his late-career rendering of “Sita Ram” spring immediately to mind), Graham’s vocal range was fairly limited, and never was this more evident than on his recordings of well known pop songs like the two previously mentioned (there are many more that illustrate this point…) But we won’t dwell any longer on that. It remains that for all of his pioneering work as a guitarist, composer and arranger, Davy Graham’s recorded legacy lives on, in relative obscurity, as a mixed bag. Enter Mark Pavey, a singer/songwriter who befriended Graham in the last years of his life, helping him regain control over the majority of his master tapes, and shepherding him through his return to the stage and recording. Graham’s final record, Broken Biscuits, was recorded, mastered and released by Pavey, and is quite charming… I highly recommend it. Pavey has gone through and remastered/reissued most of the classic Davy Graham albums at this point, and in my estimation has done a fine job with them. Anthology is by far the most elaborate package of them all, and the beautiful gatefold eco-packaging is a collage of clippings from one of Graham’s own scrap books. 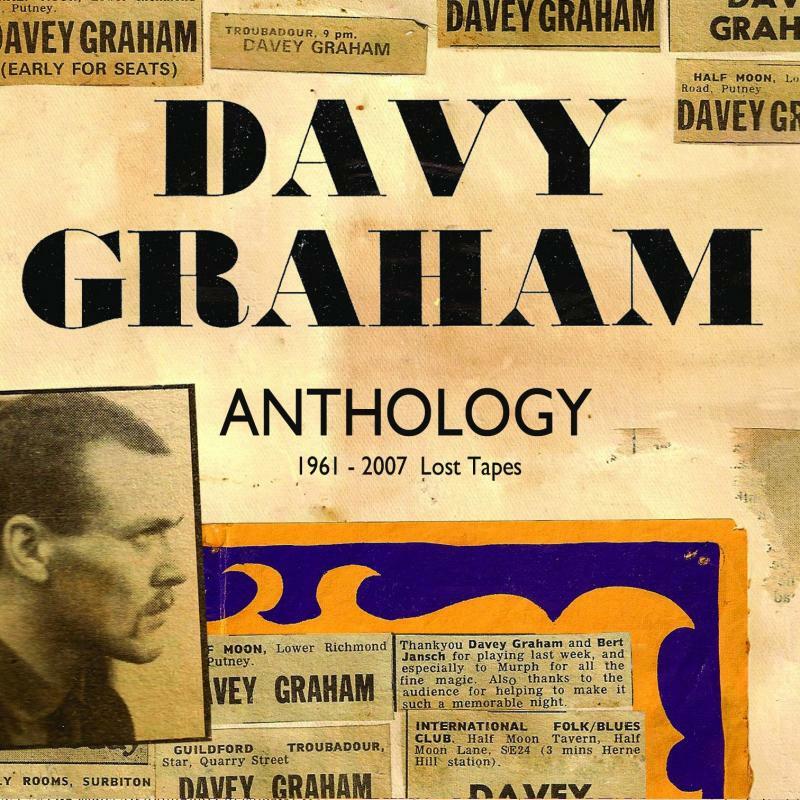 The collection’s 54 tracks are divided into 3 discs, each representing a different period (or repertoire) in the Davy Graham story. It is a lot to take in. The first disc contains Graham’s earliest recorded material, dating 1961-1963. The disc begins humbly enough, with a casual rendition of “Southbound Train”, before kicking into “Here Comes The Carnival”, an early instrumental that featured Graham’s upbeat and mercurial playing in his signature jazz-blues style. Graham takes that feel a step further with his original “Fingerbuster”, on which his lightning fast jazz playing leaves the jaws of a small audience agape. Graham’s arrangement of “Take Five” is a real revelation, particularly for its time. It’s on this demo that Graham shines a light on the real potential of the acoustic guitar as a solo instrument… and while the later studio recording features a jazz rhythm section swinging along with Graham, this version finds the guitarist carrying each nuance of the Dave Brubeck masterpiece with ease and style. Another highlight included on this disc is the first ever recorded version of “Anji”, the song that most audiences associate with Graham (especially in the US, thanks in no small part to Paul Simon’s cover on the Sound Of Silence LP, which is the record that I learned it from). This version features a short explanation of the song’s origins by Graham himself, before he launches into what could well be considered the definitive performance of his most beloved invention… in a word, stunning. This track is particularly interesting because the master recording used for Anthology is the very same tape that was sent to Bert Jansch, exciting Jansch’s own fledgling fingers and launching him into acoustic guitar history. The remainder of this first disc revolves around Graham’s early explorations of the blues, and the feel is not dissimilar to the playing on the classic Live At Hull University disc, which has been in circulation for a number of years. At the end of the disc, though, “She Moved Through The Fair” and “Mustapha” hint at the Anglo-Eastern fusion that Graham would explore for the rest of his life. Disc 2 contains concert recordings captured by David Freeman, solos taken during a 1965 concert featuring Graham and then-collaborator Shirley Collins, a cherished singer of British Isles folk songs with whom Davy had recorded the indispensable Folk Roots, New Routes in 1964. These recordings are mostly jazz and blues interpretations, though “Maajun” finds Graham using his guitar to approximate the sarod, an instrument used in Hindustani music (Graham would actually play sarod on some of his Kicking Mule records in the late ’70s). The fidelity of these concert recordings is not amazing, and little is revealed that wasn’t covered on the aforementioned Hull University CD, or for that matter, the lesser known but equally awe-inspiring Live At St. Andrews 1966. The disc starts to gain real momentum with “Blues Raga”, an extended improvisation in the classical Indian style which features a couple of uncredited accompanists. The selections from one of Graham’s radio appearances are a little warbly, but contain some of Graham’s most exciting arrangements; I’ve always preferred Graham’s solemn reading of “Bruton Town” to more melodramatic versions by some of his contemporaries, and “Tristano” is an absolute tour-de-force… the version on Anthology might be a little tentative compared to the studio version, but it should still be plain to see why this is one of my personal favorite guitar instrumentals of all time. The third Anthology disc contains some of Graham’s most highly developed material, dating from the dawn of the ’70s until his final tour in 2007. “Happy Meeting In Glory” is about as delightful a piece of music as can be played on the acoustic guitar, and it’s easy to see why Graham and his contemporaries were so enamored of it’s composer, Bahamian guitarist Joseph Spence. “Blue Bossa” has an uptown feel, and finds Graham employing his instrument of choice for much of the ’70s, a nylon-strung classical guitar. The guitarist evokes pastoral images of old England with the Baroque sounding “For A Princess” and “DeVisee Suite”, making me wish that he had recorded more of his classical repertoire. At the end of the day, Anthology doesn’t premier a vast amount of new material… but Graham’s insatiable appetite for new sounds and approaches to the guitar, not to mention his impeccable playing in every possible live situation, should be an inspiration to players everywhere, and I know fans will find a lot to love in this collection. It would be quite an effort (and commitment of time) to listen to this entire group of tracks front to back in one sitting, and I wouldn’t really recommend doing so… rather, absorb it a disc at a time, and marvel at the evolution of possibly the most imaginative and compelling acoustic guitarist to ever pick up the instrument. One important note – this review references the track sequence of the CD version of this release. I’ve recently learned that it is also available on 180 gram vinyl, which might very well be the most epic way to experience it… but I’m not sure if the list is identical.